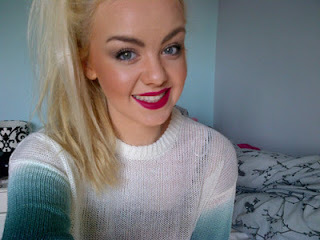 I officially have a new favourite lipstick! I had been after this shade for a while but could never find it in stock but I finally got it the other day just as it was being put on the shelf! I know it's such a popular colour and now I can see why, it's a beautiful deep berry red and I love that it's matte. It literally reminds me of red velvet it's so pretty! I have been using it with a Rimmel Lasting Finish lip liner which is a great match for the colour, however I find it bleeds a tiny bit so after a while it's not a perfect line. I think it's the lip liner and not the lipstick so i'm gonna try a different one and hopefully it'll stay put! This lipstick also has such good staying power, it lasts me all day with just touching it up after eating. I've been loving a bold lip recently and this is just perfect and I am now going to be investing in some other colours from this range! I wore it with my new faded green jumper and really loved the two colours together. It looks a lot more pink in this picture, however it is a lot darker like the colour in the first picture! Ive got two Kate Moss lipsticks but am definitely going to look for this one its such a lovely colour! !